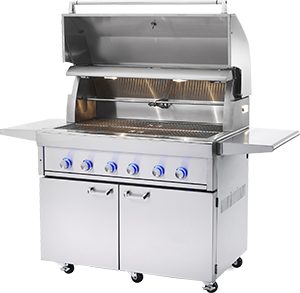 Commercial Home product is proud to be a LYNX grills, BBQ Warranty Factory Service. Check the back of your Care & Use Manual for a label with your model and serial number. The serial rating plate is usually on the underneath side of the drip tray. If not underneath the drip tray and you have a freestanding model, look on the inside left panel of the cart. If you are still looking, remove the knobs and the front panel and check on the heat shield. Clean and polish regularly using a product like Barkeepers Friend. Use the powder Barkeepers Friend to remove occasional surface rust and discoloration. If close to the ocean, use a marine inhibitor to clean and protect the stainless steel. Have service clean your manifold and apply dielectric grease to wiring connections once a year to prevent corrosion. Check your cleaning product label or MSDS sheet to be sure it can be used on stainless steel under high heat conditions.